Following undergraduate training in medical anthropology, Dr. Madeleine Tuson-Turner attended National College of Natural Medicine (now NUNM) and earned graduate degrees in naturopathic medicine, integrative medicine research and global health; along with a certificate in natural childbirth. 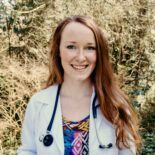 She is a medical resident at the NUNM Health Centers and adjunct faculty in the School of Graduate Studies, teaching courses in the global health and integrative medicine research departments. Dr. Tuson-Turner first developed a passion for global health in 2006, while living in Tamil Nadu, India, conducting research on traditional healing methods. Out of a desire to create equitable sustainable development alongside cooperative global health educational opportunities, she has lived and worked in Ghana, West Africa part-time since 2009. Dr. Tuson-Turner has worked with the Ghanaian Ministry of Health to learn about cultural perspectives on health and healing. Additionally, she conducted her master’s thesis, a mixed-methods research study which she designed and piloted, on maternal experience of childbirth in Ghana. Her research examined factors that influence a woman’s perception of her medical care and its relationship to her utilization of integrative therapies. Dr. Tuson-Turner’s current research interests include the ethics of global educational engagement, women’s health, reproductive health justice, and integrative medicine. She is a recipient of the Globe Trotter Award from NUNM for her dedication and work establishing relationships and creating lasting partnerships in the field of global health. Dr. Tuson-Turner’s clinical education focused on primary care and included a year-long mentorship in women’s health along with additional clinical rotations at NUNM’s community health centers. She also received additional training in applied kinesiology and pelvic floor therapy. Dr. Tuson-Turner’s clinical interests focus on physical medicine, sexual and reproductive health, women’s health, and dermatology.